Being Erin ★ : Bus. I get on the bus about 6 times a week and every single time I get on, smile at the bus driver, scan my Go card, walk to my preferred seat, sit and listen to music for the next 40 minutes. I don't talk to anyone and they don't talk to me. That's just the way we interact on public transport these days - it's the norm. Bus - such a wacky photo. 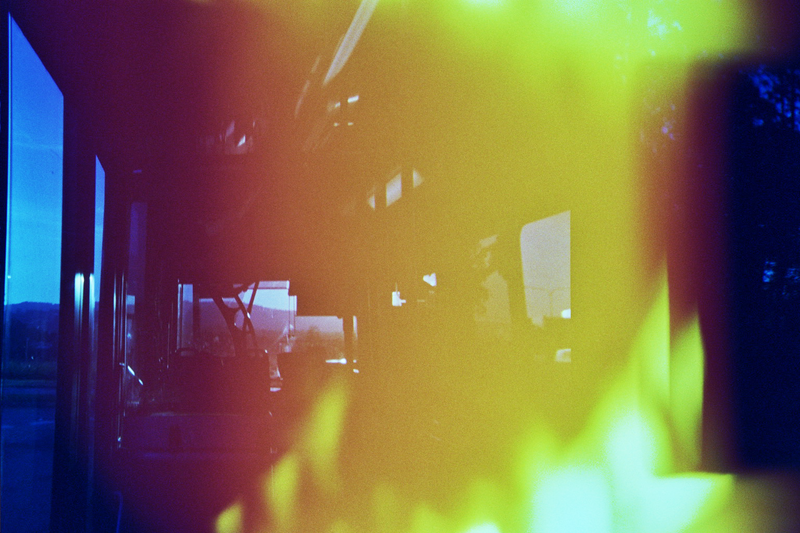 This is the great thing about lomography. Every day we pass by so many strangers with such interesting stories. I like to see this photo as a representation of all the colourful characters that get on the bus, sit in their seat and say nothing because it's the "right thing to do". We don't even have the opportunity to learn about each other because we've all got our earphones in. It's quite sad really. You make an interesting point. It's a funny thing really, people who come from all walks of life and who have destinations to get to. Yet we all seem to blatantly ignore people that could change our lives. I do the exact same thing as you when I get on the bus. I spend a lot of time on buses on my daily routine and I love to imagine what other people's lives may be. Interesting post. It's just so odd, isn't it? There can be up to 50 people on the bus and none of us talk. So weird. I wish I could change the way I am on the bus but it would just be way too awkward haha.